Form a 501(c)(3) tax-exempt nonprofit in your state You've got a cause you care about--now you just need the legal status that will help your organization raise money and work for that cause. Here, you'll find all the forms and information you need to create a tax-exempt nonprofit for your group. 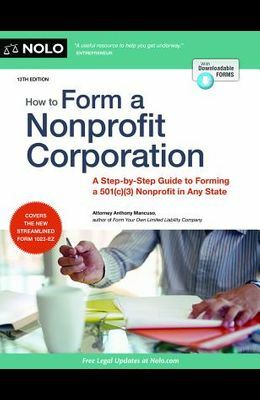 Learn how to form a nonprofit corporation in any state and gain 501(c)(3) tax-exempt status with the IRS. We provide step-by-step instructions for both IRS Form 1023 and the streamlined Form 1023-EZ federal tax-exemption application. With this book you can: choose a legal name prepare articles of incorporation create your own bylaws obtain federal and state tax-exempt status prepare minutes for your organizational meeting, and establish a corporate records book.